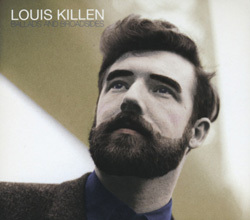 Louis Killen is a hard-core, unadulterated folksinger whose passionate delivery is matched by a deep and wide-ranging knowledge of the songs and the working people who made them. Born in Gateshead in Co. Durham, he was noted for his love of sea songs, as well as the industrial and rural folk songs of his native North East of England. Released in 1965, Ballads and Broadsides was the first full album by a solo folk singer and was, and still is, hugely influential. A great album full of great performances it was, sadly, to be the only album he recorded for Topic Records as he left Britain within a couple of years for a new life in the USA. 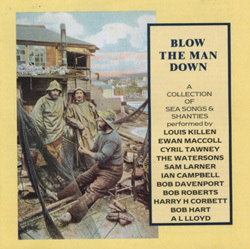 A treasure-chest of seafaring songs delivered by such fine inter-preters as Louis Killen, The Watersons, Bob Davenport, Ian Campbell and Cyril Tawney. The two dozen performances include some of the best-known of all British sea songs and shanties, evoking a long and turbulent history of shipwrecks and sea-battles, of tall ships and whalers and the men who sailed in them. The folk ballad,’ wrote A.L.Lloyd, ‘is a folk tale put into verse and set to music. 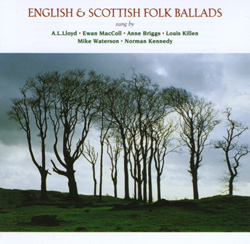 Among British ballads are some of the oldest as well as greatest folksongs we have.’ His claim is trenchantly justified by this exceptional collection, as dramas of the distant past are restaged in vibrant performances by Ewan MacColl, Anne Briggs, Louis Killen, Mike Waterson, Norman Kennedy and Lloyd himself. 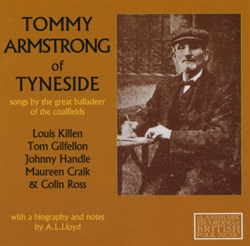 The remarkable writings of Tyneside ‘pit poet’ Tommy Armstrong (1848-1919), one of the finest of allÂ working class song-makers are celebrated in a recording by some of the North East’s finest folk musicians.